Over 26 years of experience building and repairing coolers for heavy industrial equipment in the oil rig, mining and construction industries. Segers Industrial Radiator specializes in repairing coolers for oil and gas drilling rigs throughout Pennsylvania and the surrounding states. 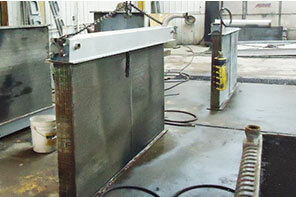 We can custom build any and all aluminum coolers for oil or gas drilling applications. Our expert technicians and highly skilled welders will build a custom radiator to fit the specifications of your damaged equipment. Want to know more about our capabilities? Check out some detailed case studies of the work we did and read some testimonials from our clients. Call us for a quick and accurate assessment of your radiator problem. Proper DPF cleaning goes far beyond the "regen cycle" diesel vehicles are capable of. Feel free to contact us any time with your questions. Whether you need a new radiator or repairs on an existing system we are here to help.